That's just stunningly beautiful! Have to admit that it's a recipe I'd probably pass over without a second thought if I hadn't seen the photograph. Are those things that look like berries the pink peppercorns? Do they taste like black pepper? Inquiring minds want to know. I can't tell from licking my monitor. What an education this place is! 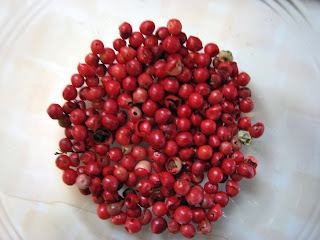 I didn't even know there was such a thing as pink peppercorns ... but what a delicious-sounding (and -looking) treat. 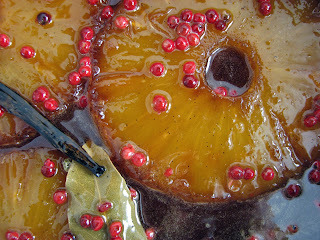 My mind keeps trying to find the pork--lol--early Chinese food training associates pineapple and pig--but this looks like a beautiful unusual dessert! If that isn't THE most alluring panful of beauty! Okay, what's your method for getting the pineapple from intact to these nice ROUND, small-cored horizontal slices? I whack the ends off then quarter the fruit vertically -- easy to trim the shell off each quarter that way, but it wouldn't produce discs like these. Do you have a special tool, or just buy the fruit in shelled-cylinder form? 'Twould taste just as good in chunks, but not look so elegant . . .
Hi lotus! Years ago when I finished pastry school, I kinda went crazy buying tools. So I happen to have an apple corer that I used on the pineapple slices. But quartered slices would be beautiful, too. It's that gorgeous yellow that pops no matter what the shape! op99, the pink thingies are the peppercorns! They aren't nearly as strong as regular pepper. Not much heat but rather more floral in flavor. Since they can be quite hard to find, I would recommend this dessert anyway. The combination of bay leaf, vanilla bean and caramel are really inspired. I'm still laughing about your monitor!